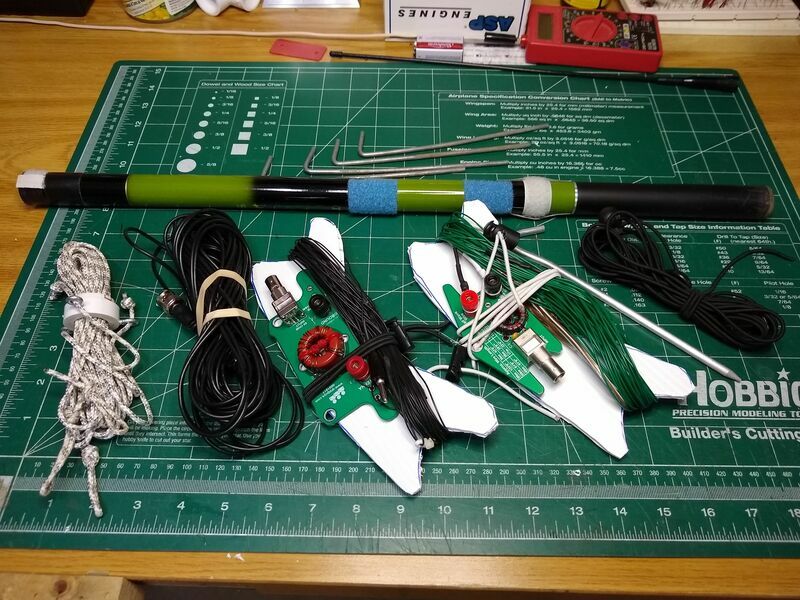 2019-03-24 After a number of days playing with my end fed half wave antenna cut for 40 meters but usable on 20 meters, I decided to put together a go kit (again!). 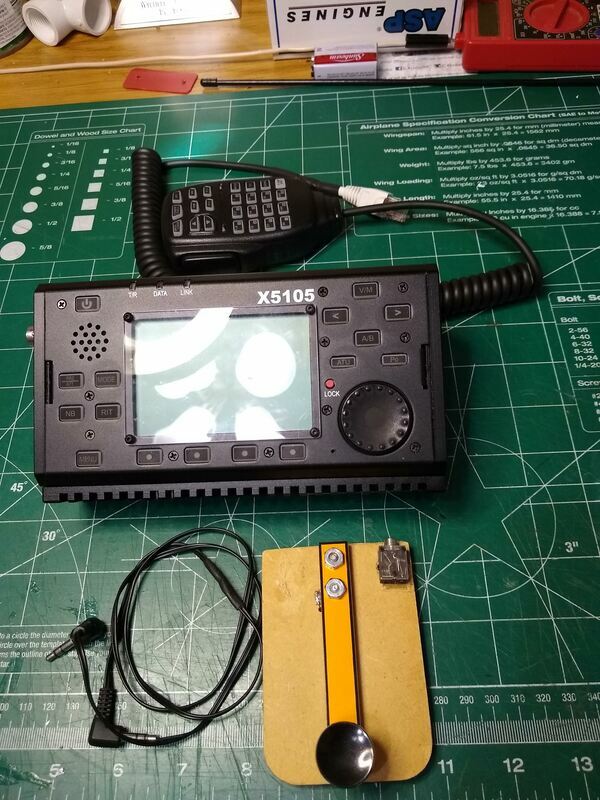 The primary pieces are the x5105 including mic and key, a 4.5ah bioenno battery, my efhw antenna and a 35 ft end fed antenna. 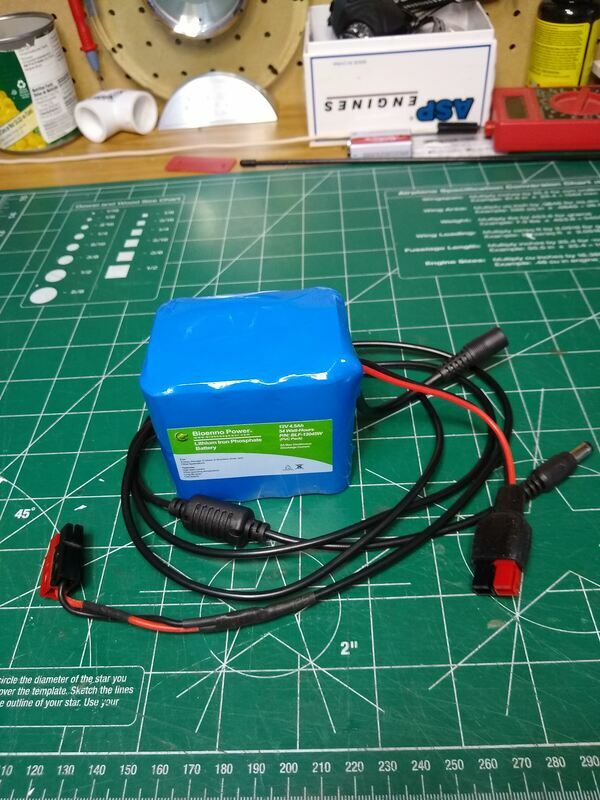 That should provide many hours of operation with good coverage on 40 and 20 meters with and perhaps less efficient coverage on all bands from 80 through 6 meters with the 35 ft antenna. The mast is a 14-1/2 foot push up fiberglass fishing pole. Top left, kit packed up. Top center, contents packed. Top right, radio, mic, key & Key cable. Bottom left, Bioenno 4.5ah extra batter & cable. Bottom Center, 35' EF, 40 meter EFHW Antennas, Coax, ground stake, 14.5' mast with guy lines & shock cord. Bottom right, note pad and pens. Two antenna systems: QRPGuys based 35ft end fed antenna and QRPGuys based end fed half wave antenna cut for 40 meters. Both of are mounted for convenience onto DIY wire winders along with their respective wires. The antenna system also includes a 25ft BNC terminated length of RG-174 and a ten foot BNC terminated RG-174 section with a couple. 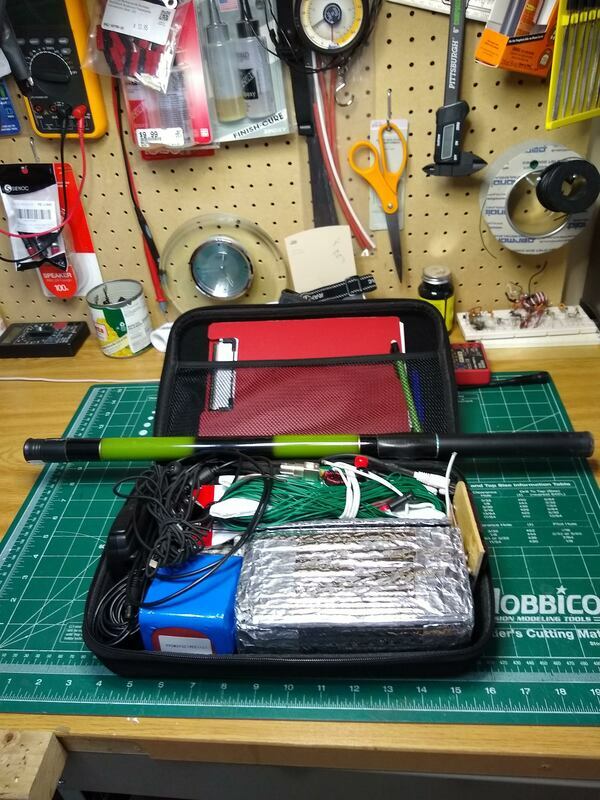 I've included an aluminum tent stake for grounding the EFHW antenna and a length of shock cord with cord lock for tying off the far end of either antenna as needed and 14.5 ft push up fishing pole with collar guy ropes and tent pegs. 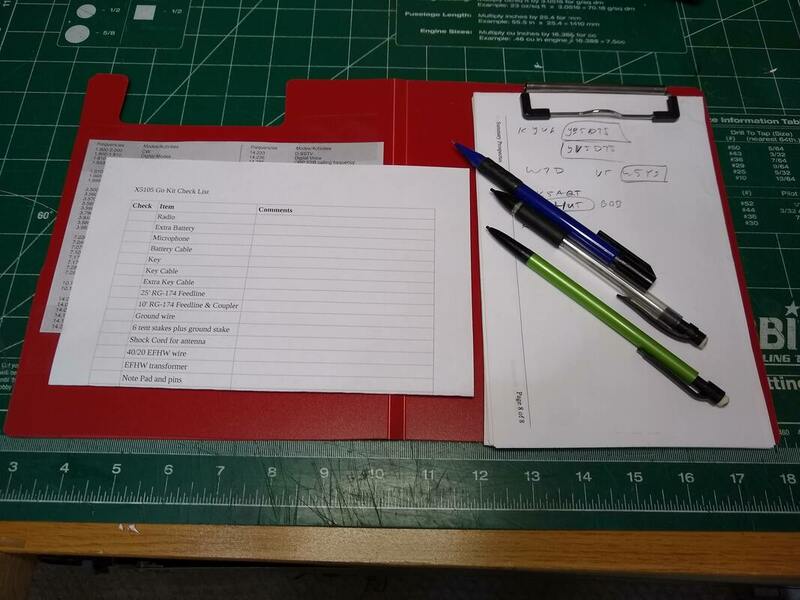 The final piece is a note pad and pens along with a check list and a couple other cheat sheets of nets and various other frequencies of interest and a copy of my license. 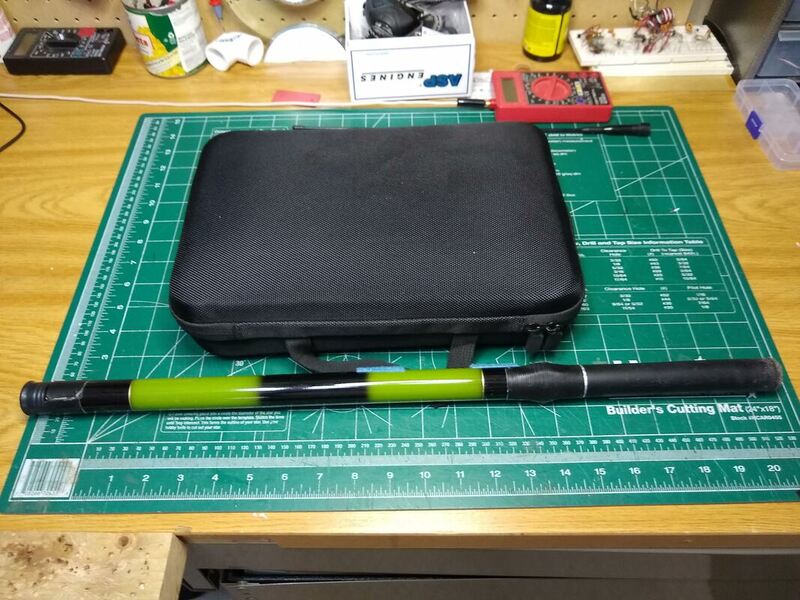 Total weight including the case and mast is 7 lbs. I got the semi-hard sided case as part of an order of GOPRO Accessories on Amazon several years ago. Its outside dimensions are 13" x 9" x3". Wish it we an inch longer and wider but everything fits snugly! If I've planned it well, everything I need is in the package! If not, I'll find out.... I do keep thinking about the statement, "One is none and two is one!"